Dubai,United Arab Emirates,28 November 2018: After a twelve year retail reign in The Dubai Mall, home interiors and festive decor store Irony Home are here to kick - start the festive season, launching their first Christmas pop -up store in collaboration with The Lime Tree Cafe and Kitchen. Founded by Rima Dardenne, Irony Home closed their doors at The Dubai Mall and made the bold move to online store, launching their e-commerce platform ironyhome.com. The collaboration at The Lime Tree Cafe will be the first time Rima brings to life her magical Christmas Wonderland, outside of The Dubai Mall. “Pop-up stores are taking over the retail world. Pop -ups are the perfect avenue for online stores to make a “flash” appearance and reach customers they could not reach before. These stores are used to launch new products, generate awareness and introduce collaboration. The Christmas products that we will be offering at Lime Tree Café have been carefully chosen and curated for their clientele. There is nothing better than a home that gives the feel of comfort and peace all at the same time. Our Christmas items have been selectively chosen to compliment the style and interior of all Lime Tree Café clients Pop-up storesare exciting because they are creative and engaging.”-Rima Dardenne, President and CEO of Irony Home. Can’t contain the Christmas excitement? 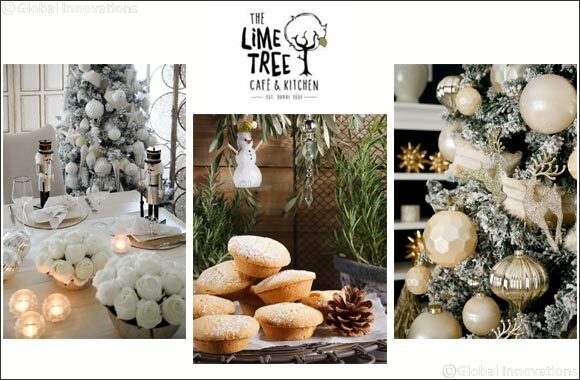 Head down to The Lime Tree Cafe and Kitchen this November for a one-stop-shop this holiday season as Irony Home showcase their extensive collection of pre-lit trees adorned with tree skirts, christmas stockings, ribbon, magical ornaments, striking table tops and centre pieces, lights and garlands all for you to shop-til-you-drop! And, don’t worry if all the Christmas excitement has got you feeling a little exhausted, The Lime Tree Cafe and Kitchen will be serving up coffee, traditional mince pies and puddings to shoppers, whilst their team are on hand to provide expert gifting advice and ideas! Stock up on essentials such as festive preserves and artisan crackers to compliment your Christmas cheese platter and for some seasonal sweetness, pick up florentines, fudge, cookies, confectionary and warming aromatic spices for mulled wine. Customers can even design their own gift hampers that will be beautifully packaged and wrapped while they wait with a selection of boxes, baskets and ribbons to choose from. The Lime Tree Cafe and Kitchen have also opened their Festive catering orders, offering a online click-and-collect service for the first time ever. Simply head over to www.thelimetreecafe.com/clickandcollect where customers are able to order their Mince Pies, Puddings, Party Canapés, Turkey Platters and Festive Cheeseboards all online. Freshly baked Mince Pies and Mini Truffles will be on Cafe counters everyday so customers can pop in anytime & pick up a dozen along with mini Christmas puddings with custard, and a Cafe Christmas Menu! Truffle flavours include Cranberry & White Chocolate Cheesecakes, Florentine Tartles with Praline & drizzled with Dark Chocolate. The Irony Home Christmas pop-up store is open daily from 8am-6pm at Lime Tree Cafe and Kitchen located on Sheikh Zayed Road, opposite Gold and Diamond Park.